Root Canal Symptoms: The Root of Your Fears? 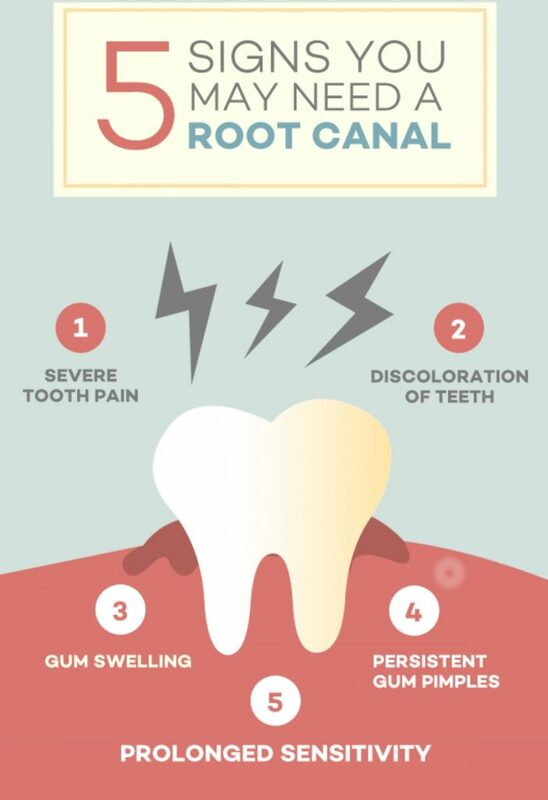 Root Canal Symptoms: What is at the root of your fears? Are you having root canal symptoms? You don’t have to be an insider within the dental profession to be familiar with the term “Root Canal”, as the mere mention of the term has left many dental patients shaking in their shoes. Perhaps due to its association with pain, or perhaps simply due to its serious sounding name, root canals have seem to have become the dental community’s version of the boogeyman! As result of this, root canals have received something of a bad reputation among patients, and while the thought of getting a root canal may sound a bit scary for some, few people truly take the time to ask what exactly a root canal is? Well for starters, the term root canal doesn’t refer to a dental procedure, but rather to the pulp-based chambers and canals within and around the tooth. Much like trees and plants, these chambers and canals serve as the inner source of nourishment or (to put it bluntly) the guts and roots of the tooth. The procedure often mistakenly known as a “root canal” is correctly known as endodontic therapy. And rather than the boogeyman, this procedure is actually something of an angel in disguise. “Endo” being the Greek word for inside, and “Odont” being Greek for tooth, is (as its name implies) the maintenance and restoration of the inner anatomy of your tooth; which as you will see here is often not what its perceived to be. Obviously, the chamber and canals within your tooth are of vital importance to the overall health of your tooth; however, if decay, damage or an infection were to contaminate this connective tissue, this otherwise healthy pulp chamber can quickly regress into a chamber of horrors and require treatment! Whether it be decay from improper dental hygiene or simply damage from a chipped or cracked tooth, if the pulp becomes infected, you’re going to notice. While the symptoms of the infected pulp and root may vary at first, chances are likely they will greatly worsen over time. Living with such persistent pain may become increasingly difficult or even unbearable. Therefore, to remedy this pain and prevent any further complications, endodontic treatment is essential. The process of replacing and restoring the root canal has been one of the more sophisticated and important procedures available in modern dentistry for many years now. As mentioned previously, this procedure has garnered something of a negative perception over the years. However, as illustrated by the above-mentioned symptoms, truthfully the entire purpose of endodontic treatment is to restore the tooth and relieve any discomfort you may be experiencing. The initial (and often most stress relieving) phase of the treatment is to prepare the tooth. This includes numbing the tooth and affected area, then creating a small opening through the tooth’s crown into the pulp chamber. The second and perhaps most important phase is the removal of the pulp or nerve tissue of the tooth. In this phase the pulp is entirely removed from within the tooth and the pulp chamber along with all root canals are cleaned and reshaped. The purpose of this is to remove all infected tissue from the tooth, then prepare it to be refilled. Much like the second phase, the third phase focuses on the continued expulsion of the infection from within chambers and canals. A sterilizing material is placed within them to rid the tooth of any remaining bacteria. Once complete, the tooth is then sealed with a temporary filling, to prevent contamination. The fourth phase of the endodontic treatment is a bit of a transitional phase and in some cases, may likely require two separate appointments to fully complete. Upon return, your dentist will remove the temporary filling and re-examine the tooth to ensure the infection has been totally eradicated. In advanced cases antibiotics may be required prevent the infection from spreading. The final phase is when the dentist ultimately restores the tooth by administering a dental crown or a filling. This step strengthens the tooth, and returns it to its former healthy appearance. While this completes the endodontic treatment process, it’s important to continue scheduling yearly routine dental appointments and practicing proper oral hygiene at home, as failure to do so may lead to additional complications! Root Canal Symptoms: Nothing to fear but fear itself! As you can hopefully assume, in spite of the hype and less than stellar reputation, the highly misunderstood endodontic treatment, (or root canal as it’s so often called) is truly nothing scary at all. Yes, like the Loch Ness Monster, the Abominable Snowman and the Boogeyman, this so-called monster is nothing more than myth and at Overland Park Dentistry we are more than happy to prove this to you! Is having endodontic therapy the most desirable situation to be in? Of course not! But is it the awful, miserable, nightmarish experience that some would lead you to believe? Not at all! So, if a painful root canal is making your life a nightmare, have no fear! Come see us at Overland Park Dentistry so we can treat your root canal symptoms! Dr. Charles R. Kimes, DDS and his expert team at Overland Park Dentistry look forward to having the opportunity to care for you and your family with endodontic treatment or any preventative, restorative or cosmetic needs you or your family may have. To schedule your dental appointment with your Overland Park Dentist, contact us at our south Overland Park office at (913) 647-8700 or our north Overland Park office at (913) 341-2380.